Oconomowoc Web Design Service – Websites that work for you! Oconomowoc Sign Company has teamed up with MC Services to offer affordable, high quality website design for Oconomowoc Area Businesses. You already know us, so here's a little bit about MC Services. MC Services is a Milwaukee based web design and development service specializing in websites for small and medium sized businesses. We offer low cost web sites that pack a big punch for the price and save you time and money. We have a knack for quickly understanding what it is that our clients want, what they need and what their website should have. We have a no-holds-bar attitude about getting you exactly what you need – so don’t be surprised if we strongly object to that splash page or tell you that Flash could be hurting your page rank. One thing we’re not is a group of ‘yes men’ who will sit back and take your money while giving you a site that wont deliver results. 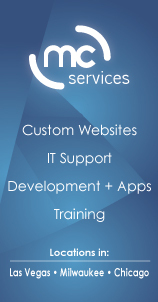 MC Services is able to keep our web design prices low because we have a dirty little secret. We don’t carry the overhead that other web companies do. We’re a small group of talented designers and developers. You pay for the work we produce not for where we work or what tools we need to get the job done. Your only cost is our time and talent. Recurring Cost – No way! We’re able to keep your web costs down because of two main reasons. First we design and develop your website using WordPress – a free content management system that is as easy to use as it is flexible. What would normally take months of hand coding is already in place and ready to use. Secondly, we teach you how to maintain your website yourself. A MC Services website gives business owners the ability to easily manage their content to keep their customers up to date without the recurring costs involved with hiring a web developer for every simple change. Edit your content, change images, post coupons and specials, display upcoming events – make the changes you want, when you want and turn visitors into customers! It’s a simple philosophy that works! We’ll also show you how to use your website in conjunction with social marketing tools such as Facebook, Twitter, and LinkedIn to get the most out of your website. It’s our goal to provide businesses with websites that work for the business. Too many websites fall dormant because of the costs involved with making content changes, but that’s not the case anymore! Lowcows is changing the way business gets done online! If you’re ready for a website that works for your business, we look forward to working with you. If you're interested in learning more about a website for your Oconomowoc Area Business, contact Oconomowoc Sign Company to schedule an appointment with a MC Services representative.